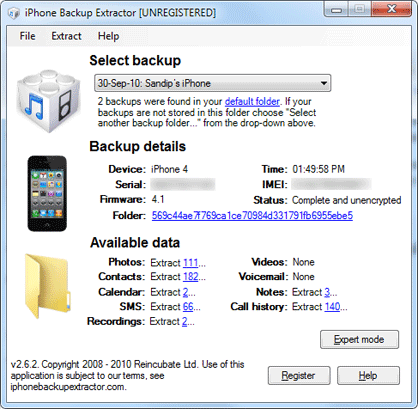 If you want to extract all your contacts, sms messages, notes, call histories, photos and videos from the local backup of of your iPhone, iPad or iPod Touch on your computer, then iPhone Backup Extractor is the app you should use. The application is compatible with Windows XP, Vista and Windows 7, Mac OS X and Linux. iPhone Backup Extractor supports iPhone 4, iPhone 3GS, 3G. It supports iOS 1 to iOS 4.